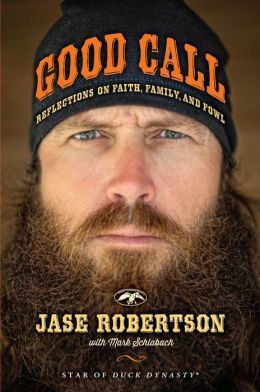 Duck Dynasty’s Jase Robertson shares his life’s experiences in hunting, evangelism, marriage and parenting in his new book, Good Call: Reflections on Faith, Family, and Fowl. Jase Robertson maintains the humorous approach he’s known for as he talks about how he managed to save his virginity until marriage, and the bag of pot a young man brought to a Bible study that he and his wife, Missy, hosted at their first home. In the book, Jase Robertson is open about the anger he felt toward his father, Phil Robertson, who had abandoned him and his two brothers. He also talks about how the birth of his daughter, Mia, has enabled him and Missy to help other parents who have a child born with a cleft lip and soft palate. Among the stories Jase shares in a chapter about “facial profiling” happened in an airport en route to speak to a Christian men’s group in Montana. Since the event was being held right after hunting season, his beard was in “full bloom”. After receiving suspicious looks and a pat-down from Homeland Security, he accidentally bumped into a woman who then screamed when she turned around and looked at him. When he finally reached his gate and sat down, a young boy asked him for an autograph and he logically assumed the boy recognized him from Duck Dynasty. After receiving the autograph, the boy asked Jase Robertson if he could ask him a question. “Sure, buddy,” Jase Robertson said. “Wait a minute,” Jase Robertson said. “It didn’t take me long to realize the boy had no idea what I was talking about,” he added.